I have had so many requests for a construction update—so it’s finally time. The last addition update was at the start of foundation, electrical and plumbing work. I hate electrical and plumbing work— you can’t see any beautiful results! We are now into the framing, decking and roofing phase—tons of amazing results now. 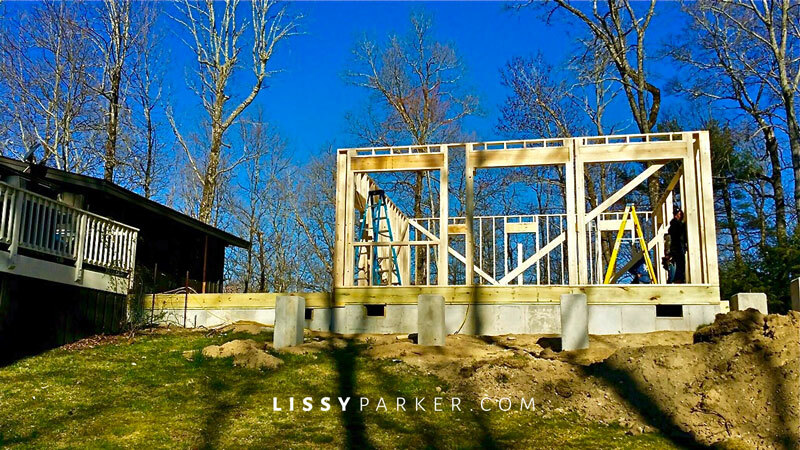 My new office is framed in and I can’t wait to move lissyparker.com to its new headquarters. The new pavilion room and porches are all in place, as is the covered walkway. The plan is to tie the cedar decking into the old deck and the side porch is, well, GONE! I thought it was a little wobbly, but it turns out it was rotten. We had to rip it off down to the house frame! Yikes … thinking that was just a little unsafe. Take a quick look at my Construction Update. It took six men to set this beam in place—and grills are everywhere (Mr. P loves grills). The covered walkway will be screened in—no more bugs! I never tire of this view—or this porch. Spanish cedar decking ties all of the porches together. Cherry blossoms decorate the newly-delivered gravel. New footings will be poured for the garage addition and walled garden. It’s going to be amazing, Lissy and the view is spectacular. Happy Wednesday! We have discovered a whole new view of the valley on the new deck—will post that when the rail is finished.